Ready to rule the roost! 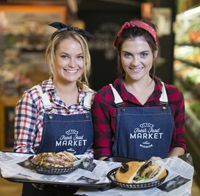 Friends and highly successful entrepreneur's behind The Secret Feast, Do the Honours and Preach Chicken, head chef Ashlee Ede and Heidi Hatherell set to take on their new venture... the Otto's Hen Haus! Townsville is now able to peck on what southerns have been privy to for months! Delicious, juicy, mouth watering big birds cooked on charcoal, rotisserie and yep... southern style fried chicken! One of the most exciting things on offer is the option to grab your whole dinner on the way home from a stressful day's work! The chook, the vegies, the salads, the lot! All boxed and bagged, all trimmings without the fuss.